Denmark were the clear favorites to win this match with the Australians trying to avoid a defeat and stay alive in this World Cup 2018. In the 1st half, as expected, it was Christian Eriksen who put Denmark in the lead by rifling the ball into the nets. Australia were now attacking to equalize the scoreboard. Luck favored the Australians once again as a handball from Poulsen awarded them a penalty. 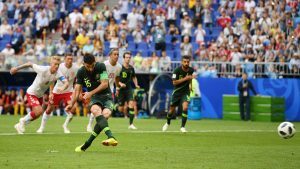 Australia’s captain and penalty specialist, Miles Jedinak took the shot and scored to put Australians in the lead. No further goals were scored in the 1st half as it ended with the score being (1 – 1). In the 2nd half of the match, both teams searched for the tie-breaker goal but each team’s defense was quite impressive as the match ended in a draw. Miles Jedinak has netted 20 goals in 78 caps for Australia since making his debut in March 2008. In the same time period he has only scored 26 times in 301 league appearances for his respective clubs. Now that’s patriotism. France started the match as the favorites against Peru who did not get a single win their last 5 matches. 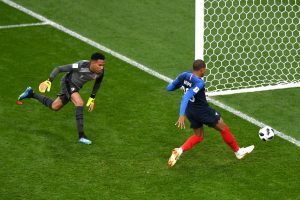 Early attacks in the 1st half by France bore fruit when Kylian Mbappe finally managed to score from close range to put his team in the lead. WATCH: Kylian Mbappe became the youngest FIFA #WorldCup scorer for France with this goal that secured a spot for Les Bleus in the knockout stages. Peru didn’t score a single goal and the 1st half ended with the France in the lead. In the 2nd half, Peru still looked hopeful and their dominance in possession was allowing them to get near to France’s goal post. But, the Frenchmen were pretty impressive in their defense as they defied Peru’s attackers to pass through. 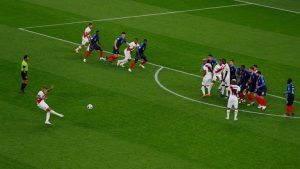 In the dying moments of the game, Peru got a free kick but despite being on target it didn’t convert into a goal and France won the match. Lionel Messi had scored against Croatia in his last two encounters against them and was hoping to score once more and return to form. In the 1st half the defending was quite commendable from both teams. As, despite some quality attacking play from both sides no goals were struck in the 1st half. In the 2nd half, Ante Rabic opened the scoring for Croatia after he netted the ball with a beautiful volley to put his team in the lead. Argentina searched for an equalizer but despite being ahead in possession no one not even Lionel Messi was struggling to score. The match now came in the last ten minutes and this where Croatian captain Luka Modric netted the ball from long range to double the lead. Argentina’s troubles were not over as a 3rd goal from Ivan Rakitic in 2nd half’s injury time tripled the lead and Croatia won the match. I don’t think it was a surprise, we came to the World Cup to challenge the best team and win every game. Luka Modric is simply a joy to watch. He’ll be 33 in two months yet he’s still dominating games at the highest level for both club and country. Another superb display tonight from the Croatia captain, stepping up when his team need him most. Luka Modric, what an unbelievable baller, best midfielder in the world since 2013 in my opinion, what a beauty!